Atlantis beneath the Java Sea? As a geologist and archaeologist, I have been fascinated all my life with the idea of a lost civilization that sank beneath the ocean thousands of years ago. The geological cross section of the region demonstrates how shallow the Java Sea is compared with the adjacent oceanic sections, and how a small drop in sea level would have completely exposed it. What is most urgently needed now is extensive study of the Java Sea, using side-scanning sonar and other investigative equipment. Perhaps the circular canals, walls, bridges, and great Citadel full of gold statues are still resting, buried under millennia of silt? 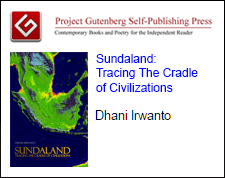 Dhani Irwanto (1962- ) is an Indonesian hydraulic engineer, who is the latest proponent of the Sundaland location for Atlantis, in his April 2015 book, Atlantis: The lost city is in Java Sea. 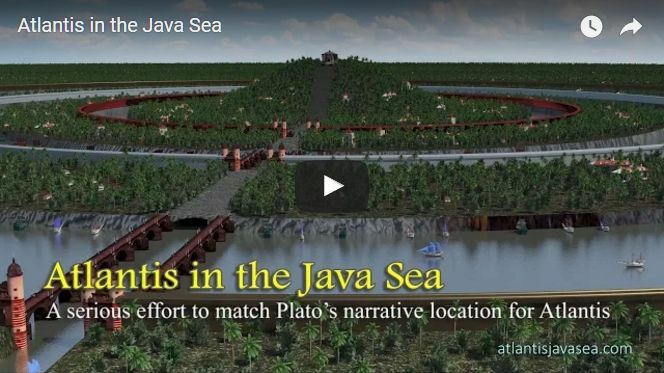 A review of his book online, shows quite clearly that the author has made a serious effort to match Plato’s narrative with his chosen location for Atlantis, namely off the southern coast of the island of Kalimantan in the Java Sea. 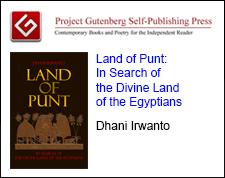 Irwanto also uses his professional expertise to analyse Plato’s many references to the waterways of the Atlantean capital and its extensive plain. The review also includes a number of maps and video clips used to support Irwanto’s views. In the labyrinth of riddles that the ancient left us to decode, there is now some light at the end of the tunnel: Atlantis, the Lost City is in Java Sea! Mysteries mounted up enough to require a total review of world’s history. We missed something at a point. It is clear, for the lack of an appropriate paradigm perhaps, that much of our history has been swept under the rug. Although the subject of Atlantis has been keen of scientists and scholars in the past, due to the high frustration of not finding anything or rather, finding more puzzles, it was rendered as a damned topic. Boldly enough, some few risked their name and reputation putting together a workable decent theory. After the publishing of Atlantis the Last Continent Finally Found in 2005, which was Professor Arysio dos Santos last work and Eden in the East, by Professor Oppenheimer, people in Indonesia are very aware that there is a reliable theory that they have the key to our long lost past. One Ancient Lost Original Culture perhaps of World Wide domain strived over there in Indonesia. This Lost ancient civilization was Sundaland, or the true Atlantis. Sundaland, or better, the sunken continent of Sundaland, is present day Indonesia. It was proposed to have been the cradle of civilization and the very Atlantis of Plato, this, with ample evidence to back up the theory. As people have to fight for their own honor and pride, it surely has to come from Indonesia the takeover, or the turnaround in the current paradigm that do not admit one nonlinear history. It seems the Biblical Flood indeed existed and history went washed out. From Indonesia now comes a torrent of evidence they indeed had the most rich, diverse and mysterious past of all. It is the duty of an evolved people putting together and maintaining their true history and eventually more: Showing the pride of ancient and perhaps even smoking gun proofs of their immense pride, as seems to be in the case, and only so follow up defending their past. Well, there is no other better way to make science than by having compromise with true values such as history and tradition. After all, we all rely on true things and true values to exist. With a great compromise to truth and backed up by a very concise and coherent theory, Dhani Irwanto surprises with his book “Atlantis, the Lost City is in Java Sea”. 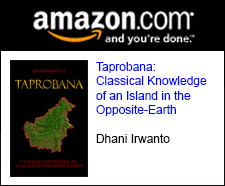 In this amazing book, Irwanto puts together some very advanced concepts, one unique class of details as to sample his research and a superb theory of his own: He has been the first man to put together sufficient evidence as to propose a coherent location for the Lost City of Plato’s Atlantis in the Java Sea! Atlantis City is supposed to be the capital of the Lost Continent of Atlantis. By locating the city in the Java Sea, Irwanto shows more research can and should be done. Just as proposed by scholars such as Prof. Santos, Atlantis was not at all a legend created by Plato and its description perfectly matches the Paleo-geography of Indonesia and shows it still, even to this day. Irwanto goes further building that the city can be located inclusively with hard evidence such as its canals, just as mentioned by Plato. Where we see indeed science was done in this marvelous but simple book, Irwanto manages to present all insider information in a pleasant and exciting way. By having a great deal of compromise to sources and by making a deep dive into Plato’s statements, Dhani Irwanto was able to put together and present a superb compilation of evidences. Anyone who pays attention to this reading will be sure he found what everyone is looking for: The Lost City of Atlantis. Indonesia indeed is the sunken Atlantis and we need look no further. As it shows, Indonesia may soon be presenting hard evidence of its glorious and forgotten past. Such as we see marvels sprouting like Gunung Padang and temples, artifacts and cave paintings and details of costumes, all showing up to testify! Much was already found as to rock the boat of current stream and to serve as a Foundation Stone for a New Era in Ancient Peoples studies. 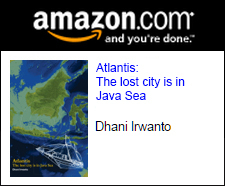 So, the information that you really need to know is here in Irwanto’s book, Atlantis, the Lost City is in Java Sea, look no further. We fully back up Irwanto’s work, which we consider to be a real blessing to Atlantis and Lost Ancient Civilizations studies. We wonder when the sequels will be seen. 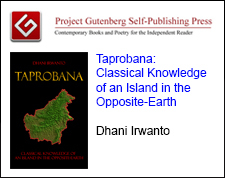 With due credits given and constructing a reproducible set of clues and evidences, Irwanto shows a delightful book where he manages to put together much that is available on the internet, but in an order that makes sense and can be very useful to any serious researcher on Atlantis. This Book Atlantis, the Lost City is in Java Sea is indeed a great informative reading. And possibly the best advent and evolution in Atlantis research in a decade. I bet one could not find anything out there published in a better value. With fully colored maps and a plethora of single lovely items and descriptions carefully edited and pieced together, we see here the sketch of one sense making, no nonsense theory that is hard rock, impossible to deconstruct. Way to go Dhani Irwanto! We love this Book and expect to see more of you out soon. Der 1962 geborene indonesische Hydraulik-Ingenieur Dhani Irwanto hat sich mit der Veröffentlichung seines im April 2015 erschienenen Buches “Atlantis: The lost city is in Java Sea” in die Phalanx derjenigen Forscher und Autoren eingereiht, die den versunkenen Subkontinent Sundaland im Gebiet des heutigen Indonesien mit Platons Atlantis identifizieren. Der Atlantologie-Enzyklopädist Tony O’Connell bemerkt unter Verweis auf eine umfängliche Rezension des Buches, “dass der Autor eine ernstzunehmende Anstrengung unternommen hat, um Platons Bericht mit der von ihm gewählten Örtlichkeit für Atlantis in Übereinstimmung zu bringen, genau gesagt vor der Südküste der [Provinz] Kalimantan in der Javasee. Irwanto nutzt auch seine berufliche Fachkenntnis, um Platons viele Verweise auf die Wasserwege der Hauptstadt von Atlantis und der ausgedehnten Ebene zu analysieren. Die Rezension enthält auch eine Reihe von Karten und Video-Clips, die verwendet werden, um Irwantos Ansichten zu stützen.” In der Zwischenzeit ist dieses in der Tat beachtenswerte Buch auch in Auszügen bei Google Books frei einsehbar. This is very exciting. I was already convinced by Dr. Santos, but this adds a great deal of additional needed detail. I’ve just received my copy of Dhani’s book, “Atlantis: The lost city is in Java Sea”, and I must say it is a model of thorough research by a consulting hydrologist who knows what he is talking about. The physical production, with clear coloured maps and tables, is superb, and I recommend it highly to all who are interested in this controversial subject. 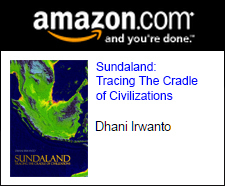 This ‘Atlantis’ trigger can be a red herring, but this book can act as a fascinating introduction to the wonders which are surely soon to be uncovered on the land and in the waters around Indonesia, whether they are labelled Atlantean, Lemurian or as Sundaland rising again. 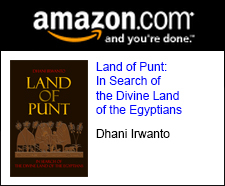 I am proud to endorse the continuance of the superb research work done regarding the problem of Atlantis as presented in this book, as well as the English version (Atlantis – The Lost City is in Java Sea) by Mr Dhani Irwanto that was originally started by Professor Arysio Nunes dos Santos, PhD in his book: Atlantis – The Lost Continent Finally Found.